The availability of practical, clinically approved robotic surgical assist systems for laparoscopy, the da Vinci® (Intuitive Surgical Inc., Sunnyvale, CA) and Zeus® (Computer Motion, Santa Barbara, CA) systems, opened a door that was only ajar for reconstructive laparoscopy in pediatric urology.1 The technology is novel and expensive, yet the initial results and experience justify an enthusiastic continuance of its development and application in pediatric surgicalpractice. With increasing familiarity with its potential, its applications have broadened to more than a dozen types of procedures. 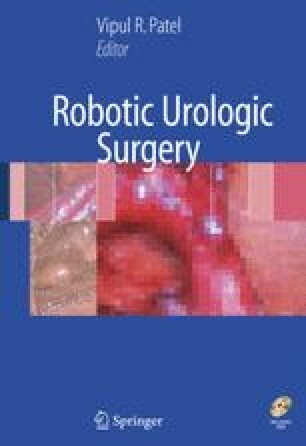 This chapter will review the current use of robotic-assisted procedures in pediatric urological practice, and provide an early assessment of the strengths and limitations and speculation as to the future directions.